Note: You most likely won't need to do this. 1. Find the Pages tab and click it to see a list of pages in the website. Admin and editor accounts may look slightly different to each other but the steps are the same. Click + to add a new page. 2. When you start a new page, you can classify what kind of page you're starting. There is no need at this stage to click anything other than 'Standard'. 3. 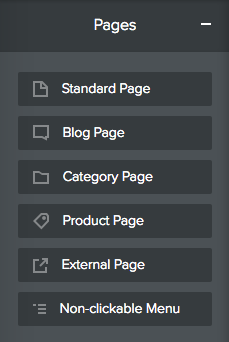 When you have created a page you will see it in the main tabs along the top of the page. This is not desired. Step 4 will show you how to hide it or bury it under an existing tab. 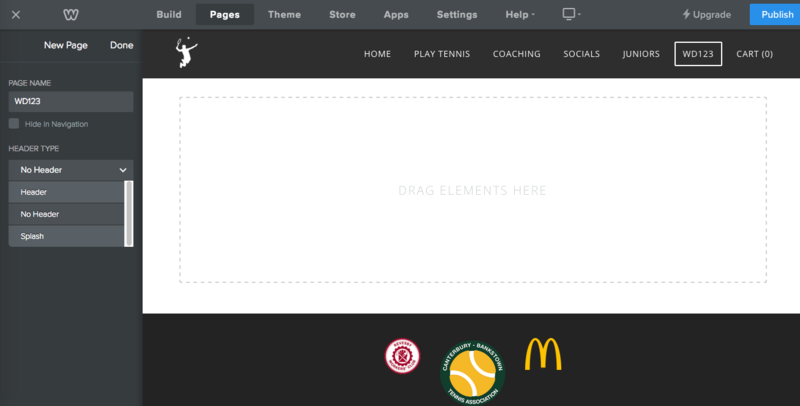 When creating a new page, the best layout to go with is 'No Header'. If you DID want the page to be found and clicked on by visitors to the site, you can nestle it underneath the existing main tabs. 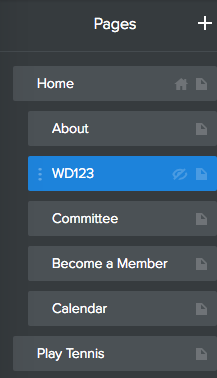 In the example here, WD123 would appear in the dropdown menu 'Home' and ranked underneath 'About' and above 'Committee'. 1. 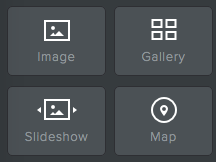 Click, hold and drag one of the choices (except Map) and drop it (let go of the mouse button) where you want the picture to sit on the webpage. A blue line will appear while you're holding the icon to indicate a rough area where it will sit and whether it will push anything to the side or up or down. 2. If you drop a single image, you will see 'upload image'. 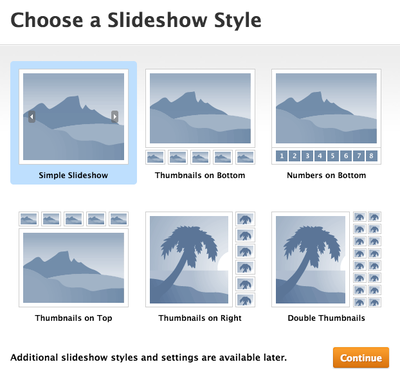 If you drop a slideshow, you will see some slideshow options. 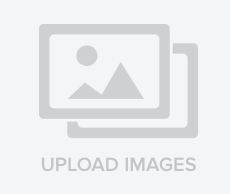 If you drop a gallery, you will see 'upload images'. 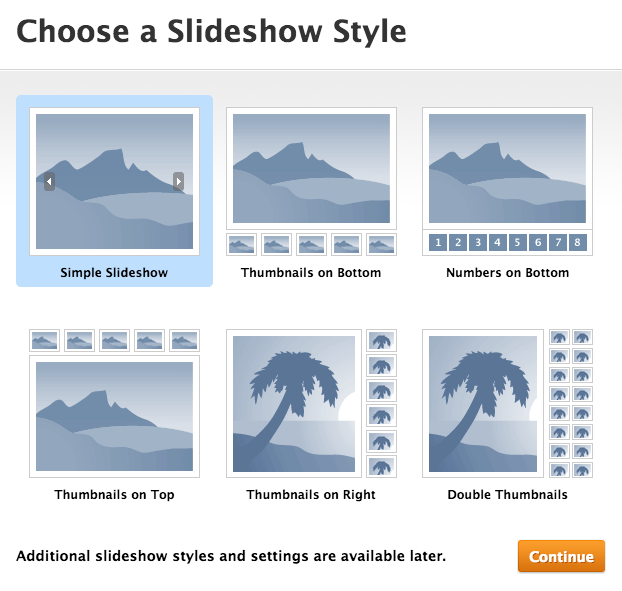 This icons will require you to click and follow the prompts. PS - the three images here are actually part of a gallery. When putting a lot of images up at once, use a gallery as it will ensure that all images appear on the website properly aligned and with the same size thumbnails. 3. 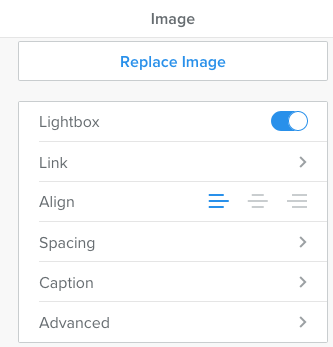 When you click on 'upload image', you will get these options (as well as 'edit image' but you probably don't need to use that). * Advanced - you probably won't use this but you can put a border around the picture by clicking here. Not recommended. 1. You probably won't need to do this but if you drag and drop a map onto the page, click on it and type in the address you want shown. There are a few options to play with but it is recommended that you leave the settings the way they are. * get it proofread - spelling, grammar and other errors reflect poorly on CBTA. 1. Don't use 'Newsletter Form'. There is an existing email capture on this website and Linda already feeds these captures into Mailchimp to send EDMs (Electronically Distributed Mail/Messages). 2. You probably don't need to add any contact forms as the CBTA website already has all it needs. 3. 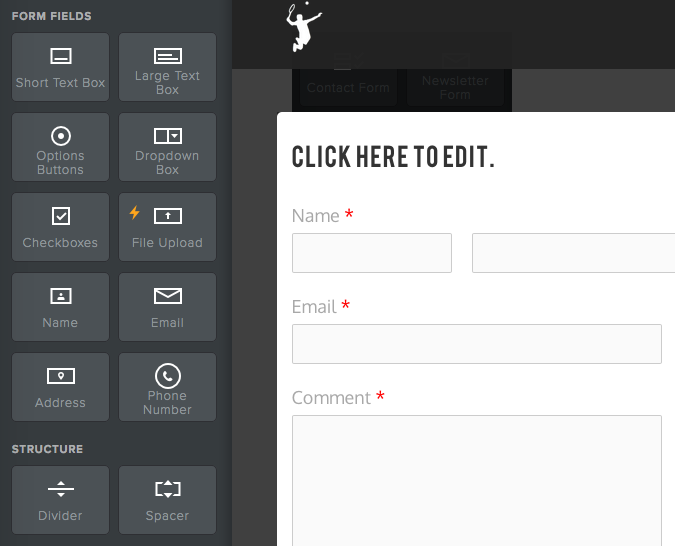 If you are adding a contact form, drag and drop the Contact Form icon to where you want the form to appear. 4. Click anywhere on the newly added contact form and (this is important), you will see the 'Build' options on the left hand side change to reflect the contact form. All fields in the contact form can now be added or deleted and there are different build options that can be added to your contact form. 5. Note - if adding a contact form, less is more. People are more inclined to fill in an online form if it asks the right questions but doesn't ask unnecessary questions. Typically, the best contact forms can be completed in less than 30 seconds. 6. 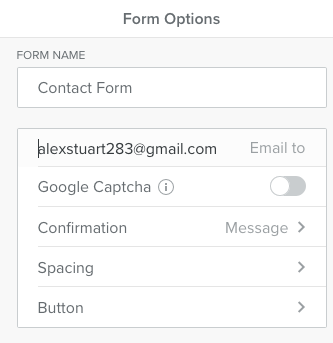 When editing the contact form (this is important), click on 'Form Options'. 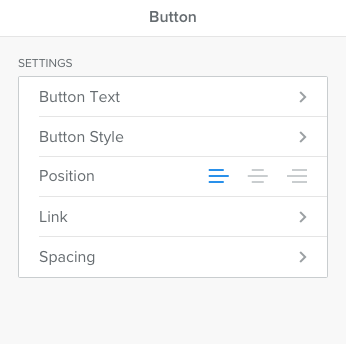 * Button - choose what you write on the button, eg. 'Submit', 'Enter Now', 'Add to Cart' etc. 1. Please remember to adhere to the existing style/theme/ design of the existing text. 2. Your options are Bold, Italic, Underline, increase/decrease font size, A (change text colour), link (chain icon) - enter a URL to send a visitor to another website when clicked, alignment, Tx (remove any formatting you've done), undo/redo (arrows). 1. Drag and drop to where you want the button to go. This is a button. Click to go to homepage. 2. When the button is on the page, click on it to get some options. * Spacing - doesn't do much. Not recommended. 4. 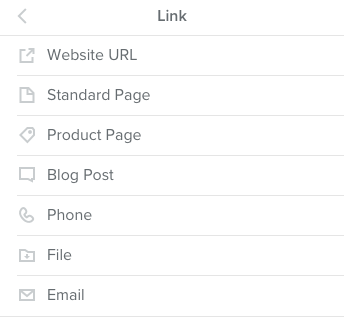 The options shown here are for 'Link'. * Email - when clicked, the computer or phone's mail application will open and enter the email address into the 'to' field. 1. Click 'Store' from the headings at the top of the page. 2. Select 'Products' on the left-hand-side. 3. You can edit any of the existing products by clicking on them, or '+ Add Product'. 4. 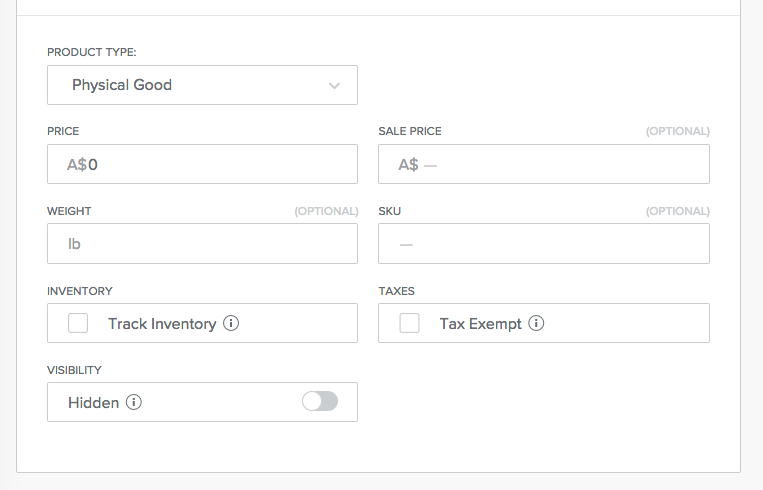 When adding a product, the prompts are very easy to follow. * Product Type - Physical Good is something you can hold, like a tennis racquet; Digital Good is something to be downloaded, like a song; and Service is something like a tennis lesson. * All other options are unnecessary at this stage. Not recommended. 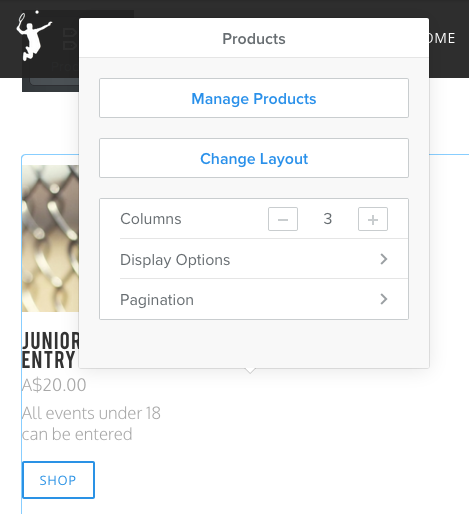 Once you have created a product, return to the editor and drag the Products button to where you want your items to appear. 7. If you are only selling one product, change 'Columns' to '1'. The Click on 'Manage Products' to return to the store where all of your products can be edited. Generally, there won't be any need to use any of the other items in the Build list. Additionally, there won't be much more that needs to be done as the website is built. Adding pages and lots and lots of unnecessary material will be detrimental to the website. Again, please remember that less is more. Please also remember that Linda is managing social media now and that will be the best place to put news, updates, draws, photos and almost everything to be honest. Got questions? I've added a contact form below. The 'Email to' will come to my email and I'll get a reply to you.